There are 267 EMS helicopters operating in the region, representing around 6% of the total fleet and 8% of the total fleet’s value (in terms of replacement cost). this has grown by around 14% since yearend 2017 — a growth of 32 units, attributed to 34 new deliveries, four pre-owned additions and six deductions. 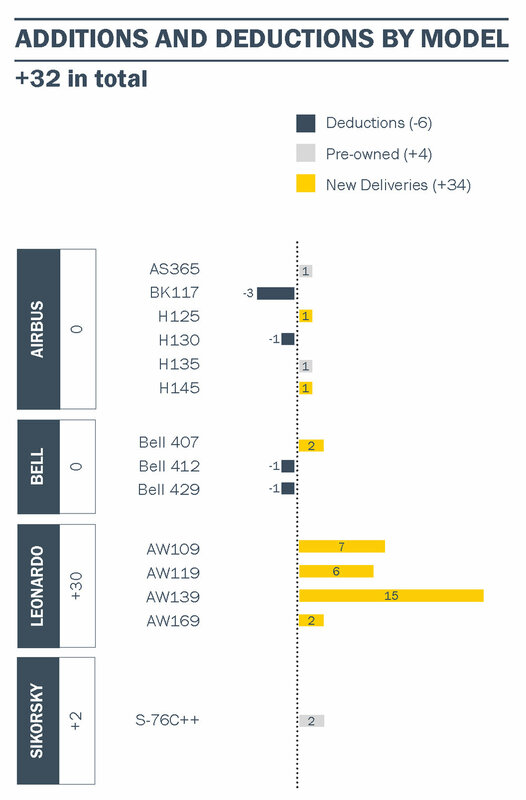 With 15 units delivered in 2018, Leonardo AW139 was the most popular newly delivered model, followed by Leonardo AW109 (7 units). Of the 34 new deliveries, 28 units were delivered to Mainland China. The EMS market has been attracting a lot of attention from operators over the past two years. EMS plays a crucial role in the medical service sector by providing emergency relief and rescue operations. These helicopters aren’t limited by topography or weather conditions and help provide emergency relief to remote areas with complex terrain. EMS helicopters can facilitate quick transport to nearby helicopters and are much faster than ground-based medical transport. In critical cases this can dramatically increase the chance of survival of patients. However, EMS operations are expensive and usually require a large investment to start up. Japan remains the largest EMS market with a fleet of 86 turbine helicopters. Lying along the Pacific Ring of Fire, Japan is prone to natural disasters and, as such, the EMS segment is of paramount importance in the country. Additionally, Mainland China saw a huge increase in its EMS turbine helicopter fleet in 2018 — by 28 units (around 60% increase), and, with a fleet of 75 helicopters, overtook Australia to come in second in terms of fleet size. Mainland China’s EMS fleet has more than tripled since 2016. This can be attributed to the Central Government’s support and attempt to provide emergency services to a nation with a population of more than 1.4 billion people. Australia dropped one rank and now has the third largest EMS turbine helicopter fleet in the region — with a fleet of 63 helicopters. Australia has a vast landmass and proportionally low population density, thus transport of those in need by helicopter is much more efficient. 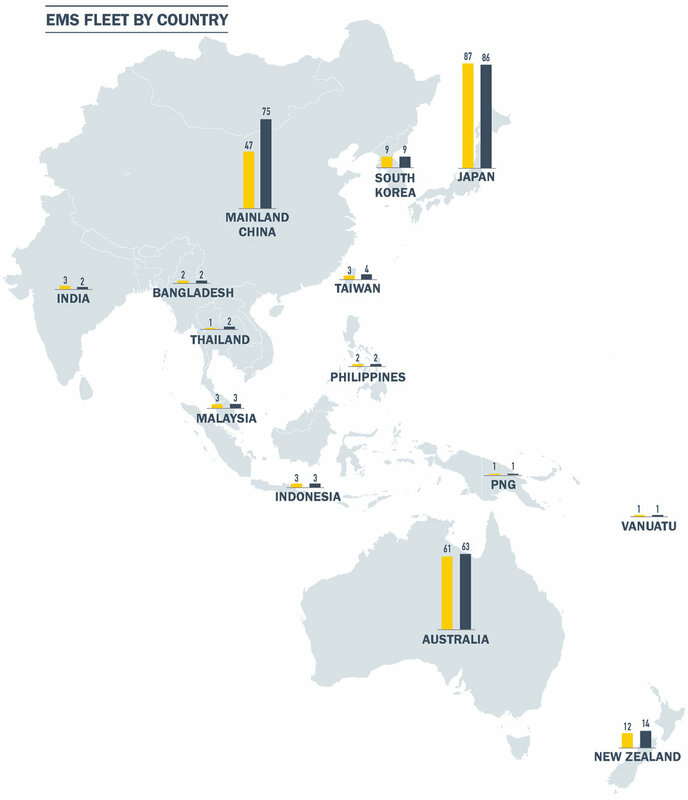 Together these three countries represent around 84% of the EMS market in the Asia Pacific region. In terms of OEMs in the EMS segment, Leonardo had the largest number of new deliveries, accounting for 30 helicopter additions, consisting of 15 AW139s, 7 AW109s, 6 AW119s and 2 AW169s. Leonardo AW139 (43) was the most popular model for EMS in the Asia Pacific region followed by Airbus H135 (40). With a fleet of 54 helicopters, Kingwing — operating out of Mainland China, has the largest EMS fleet in the region. Japan-based operators Nakanihon Air and Hirata Gakuen come in second and third with a fleet of 18 and 15 EMS helicopters, respectively. Although the EMS sector in the Asia Pacific region has been growing y-o-y, it is faced by many challenges which could potentially slow down the growth. 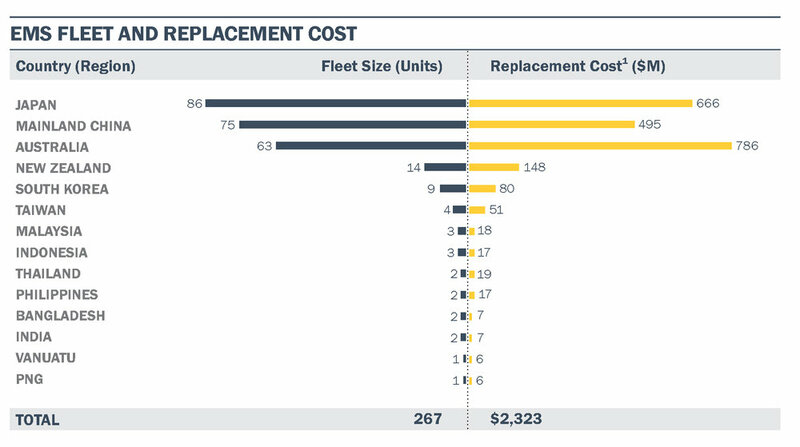 The large investment cost of increasing and maintaining a fleet is the biggest challenge faced by most operators. Government aid can be a possible solution. Certain Governments in the region have been actively supporting the EMS sector and operators by providing contracts and support. A lack of experienced personnel needed to operate the expanding fleet, which are expected to operate in almost all-weather conditions, is the next big issue operators face. The third most important issue is maintaining a sustainable business model capable of overcoming the high operation costs associated with this sector. Once operators can overcome these issues, the growth of the EMS market will be more prominent.